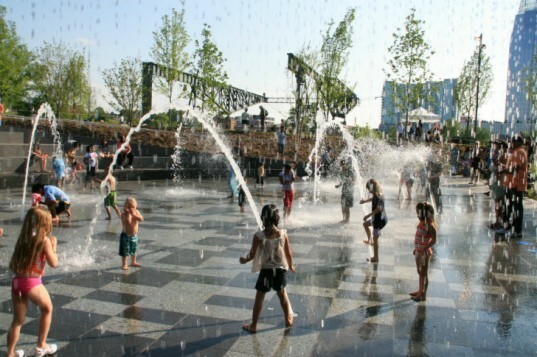 Nashville now boasts a fun new play park that offers families a great way to cool off in the summer heat. Cumberland Park, which was designed by Hargreaves Associates, is a 6.5-acre park filled with nature-inspired play spaces that get kids and parents moving. The site was once a riverfront wasteland, but through creative and adaptive reuse the space has been transformed into an exemplary sustainable development that includes geothermal energy, energy-efficient lighting, rainwater collection and habitat restoration. The 6.5 acre adventure play park is located on the Cumberland River’s east bank under the Shelby Street Bridge and is the flagship for the New Riverfront Revitalization Plan in Nashville. Cumberland Park is geared towards families and children and provides interactive play spaces and landscapes to encourage activity. “Inspired by the geology of Tennessee, the landscape provides all the fun needed with water, light, stone, rolling grass, trees, ridges and valleys. Kid’s imaginations provide the rest so you don’t have to rely so much on conventional playground equipment,” said landscape architect Gavin McMillan. “It is a park that turns its site specific qualities into a great place where families can spend a day, have fun and learn something of their riverfront history.” The park includes a local stone climbing wall, sand play areas, mazes made out plants, outdoor seating, meandering paths and other interactive play areas. There is also an outdoor amphitheater for 1,200 people and the historic renovation of the Bridge Building, which holds public restrooms, a MetroParks office, food concession, bike-share station and a soon to be announced restaurant. The park is part of a much larger sustainable redevelopment project to transform the riverfront wasteland into beautiful recreational space for the downtown area. As part of the project, Hargreaves Associates incorporated adaptive reuse, renewable geo-thermal energy use, efficient-lighting, floodplain preservation and storage, brownfield remediation, water harvesting for irrigation, and improved biodiversity in the area. Each year, 1,000,000 gallons of stormwater is captured and reused for irrigation and over 1.6 acres of meadow and riparian grasses were restored. Cumberland Park was recently completed and is now open for fun to all ages. 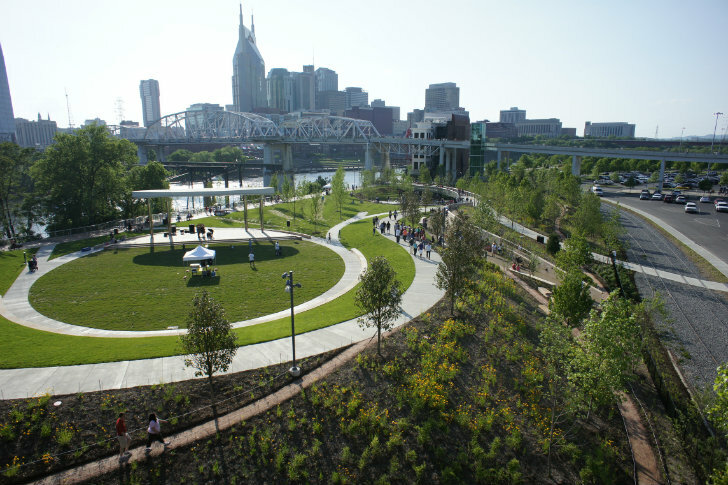 The 6.5 acre adventure play park is located on the Cumberland River’s east bank under the Shelby Street Bridge and is the flagship for the New Riverfront Revitalization Plan in Nashville. Cumberland Park is geared towards families and children providing interactive play spaces and landscapes to encourage activity. “Inspired by the geology of Tennessee, the landscape provides all the fun needed with water, light, stone, rolling grass, trees, ridges and valleys. Kid’s imaginations provide the rest so you don’t have to rely so much on conventional playground equipment,” said landscape architect Gavin McMillan. The park includes a local stone climbing wall, sand play areas, mazes made out plants, outdoor seating, meandering paths and other interactive play areas. There is also an outdoor amphitheater for 1,200 people and the historic renovation of the Bridge Building, which holds public restrooms, a MetroParks office, food concession, bike-share station and a soon to be announced restaurant. The park is part of a much larger sustainable redevelopment project to transform the riverfront wasteland into beautiful recreational space for the downtown area. As part of the project, Hargreaves Associates incorporated adaptive reuse, renewable geo-thermal energy use, efficient lighting, floodplain preservation and storage, brownfield remediation, water harvesting for irrigation, and improved biodiversity in the area. Each year, 1,000,000 gallons of stormwater is captured and reused for irrigation and over 1.6 acres of meadow and riparian grasses were restored. Cumberland Park was recently completed and is now open for fun to all ages. Cumberland Park was developed by the Metropolitan Housing and Development Agency, designed by Hargreaves Associates, built by Hardaway Construction Corp. for MetroParks. The park is the flagship for the New Riverfront Revitalization Plan endorsed by the community in 2010.